The brief for this panel is to look forward to the 2020s. For rural communities, that’s unfortunately a case of of “You can’t get there from here: you need to start from somewhere else”. So I’ll cover who we are, how we’ve ended up where we are and, most relevantly, what needs to be done, for ourselves and for the country as a whole. In our case, this is not simply about the future of networks but about the very future of our community. We’re in the familiar position of having been serially let down by ill-informed, ineffective and short-term government policies, public bodies that don’t understand the concept of delivery – and an incumbent private monopoly that is the biggest single inhibitor of economic growth in the rural UK. We’ve just under 200 properties, strung out across an area of about 18 by 8km. We have more than 95 businesses, including the #4 on Condé Nast’s global list of best boutique hotels. We also have an active and cohesive community. Like many scenic rural areas, our economy is heavily biased to tourism and farming with a few tech and marketing businesses as well as a number of people who are forced to commute long distances rather than work remotely. So what do we actually have? Easy: very little: with line lengths of between 3 and 18km, we’re marginal for 19th century telephony, let alone 21st century digitality. ADSL, even for those properties in range, gives us an average of less than 2Mb/s, about 2/3 of that of rural Uzbekistan. And it’s unreliable. Very unreliable. A conservative model of local economic uplift from broadband for various technologies suggests a first year benefit (Gross Value Add) of around £8M for Fibre to the Premise (FTTP). Of that, £6.9M is in asset value and £1.1M is trading uplift. We then drop to a £2M total, of which only £130,000 was trading uplift for even the most optimistic Fibre to the Cabinet (FTTC) or wireless scenarios. So the benefit is very real as is the differing impact of different technologies. But we’re currently so far behind both national and global best practice that it is crippling our ability to function. As a nation, we’re also falling further behind: with the caveat that there are lies, damned lies and broadband statistics, the UK as a whole has dropped from 14th to around 17th on world ranking for delivered (rather than claimed) broadband in the last two quarters. On average peak connectivity – a rather better measure of grade of service – we’re 23rd, and falling. And most rural connectivity is much worse. If you consider strategic measures of effective broadband to include equality of opportunity throughout a country and the ability of that country to play effectively with its peers and competitors, that’s pretty damning. This is a country that’s supposed to be the sixth largest economy in the world, although, by the time I’ve finished speaking, we may have dropped another couple of places. So what’s happening, where are we and what do we do about it? There have so many – and often contradictory – government statements about making Britain or Scotland world-class digital nations that, if political hot air were bandwidth, we’d have been sorted long ago. Telecoms policy is reserved to Westminster, which directly funds Broadband Delivery UK (BDUK), the body responsible for the rollout of rural broadband services. BDUK also manages our relationship with EU state aid rules. Additional funding from the Scottish government is delivered primarily through Digital Scotland Superfast Broadband (DSSB). BDUK and DSSB each spend most of their money with BT to provide predominantly FTTC-based services, possibly the single most inappropriate technology for rural areas and for future scaleability anywhere: it’s a range-limited, obsolete technology that should not have been deployed twenty years ago, let alone now. Community Broadband Scotland (CBS), was then created by the Scottish government to support communities that fall outside the scope of DSSB and BD. The failings of the DSSB programme however mean that CBS is now overwhelmed by demand from fragmented and disadvantaged communities across Scotland. CBS is in turn reliant on approval by every other party in the chain. You can see how the bureaucracy builds. Then there’s a band of Consultants and Lawyers who are trying to tie it all together, but with a brief less on delivery than on compliance with nebulous, inflexible and continually moved goalposts (and, no, those aren’t mutually exclusive, as we’ve discovered). The elephant in the room is BT, the recipient of most public largesse and the de facto monopoly in many areas. BT demonstrates the short-term outlook of a corner store owner when it needs to behave as a long-term strategic player in society, something it consistently fails to acknowledge and live up to. When it does act, it’s usually only in its immediate commercial interest, up to and including oft-related attempts to undermine other providers and initiatives. BT’s approach is also an inhibitor of future development of ultrafast services – G.Fast and XG.Fast are even more range-limited: they are “smoke and mirrors” technologies intended merely to bolster the illusion of a strategy. In a world where fibre reach at gigabit plus speeds is in the tens of kilometres, these are at best embarrassing irrelevances, at worst a cynical attempt to retain market share, lock out competition and ‘sweat’ century-old copper assets. If BT is the elephant in the room, OFCOM is the mouse: it sits in the corner and squeaks, to little apparent effect. We occasionally dare to hope that it’ll step up and frighten the elephant, but there’s no sign of that happening. Current deployments are then accounted by postcode, which allows the projects to claim ‘success’ for all properties in an area, despite many being out of range altogether. BT also works on a 20% uptake model, which leaves even properties within range of a cabinet unable to connect due to lack of capacity. The actual uptake in rural areas is typically 60-80%, something that’s borne out by our own experience. BT also has the delightful habit of claiming us to be the European leader in fibre broadband, by counting the number of properties that fibre PASSES, despite the fact that there is no way for those properties to connect to that fibre. FTTC is NOT a fibre service. In our case, we lost two years just trying to get into the system, before undertaking an approved procurement exercise last year, with combined funding from CBS and the business broadband voucher scheme (BVS). Having rejected wireless and satellite technologies, and with BT refusing to engage with us, we ended up in partnership with an ISP to provide a community-owned 1Gb/s plus FTTP network. The total delivered cost of that will be lower than the proposed Universal Service Obligation ‘value’ measure for a 10Mb/s service, with the design and most of the donkey work being done by the community. We expected to be in build by late 2015. The voucher scheme was then withdrawn, at zero notice. So we sought, and obtained, alternative funding to fill the gap and were then ready to go again, aiming to start in Spring 2016. Next we were told that we’d now need to go through a completely new procurement, repeating our original process. That was blamed on the EU. We fact-checked that with the European Commission and found that BDUK had in fact failed to maintain its EU state aid exemptions and was frantically scrabbling around to put in place a new umbrella scheme. By that point our start had slipped to August 2016. In September we were told that we are being forced to start again, under this week’s rules, putting another six-to-eight months into our schedule. So, even if nothing else intervenes, we’ll have lost at least four years from our project, due to nothing other than egregious and overwhelming bureaucracy. In summary, the government’s approach appears to be to pretend that the Emperor is in fact, fully clad, when it’s obvious to everyone else that he’s naked and shivering. With tacit collusion between government agencies and BT to the effect that all is well and that we’re a leading digital nation, the UK lurches from one poorly framed initiative to another, each aimed at redressing the failings of its predecessor but doomed to forever repeat the same old mistakes. Portents aren’t good: the little information released by the new Scottish R100 programme suggests a continuing focus on headline download figures rather than on creating a future proof enabling infrastructure. These fragmented and contradictory policy initiatives and the determination to throw public money at BT has had the unintended consequence of allowing them to cherry-pick areas, with the consequence of inhibiting local action and investment, making us more, not less, dependent on state support. There’s a huge irony here in that Broadband for the Rural North (B4RN), which provides community-driven connectivity in rural Lancashire and Yorkshire at 1-5Gb/s, was able to get started because the lack of government funding for BT in their area gave them a big enough catchment to get started, to the point where they’re now out-competing BT throughout the region. Coming back to where I started, you really can’t get there from here: you do need to start from somewhere else. In this case, by reframing the problem, in each of strategy, market engagement and process. Public policy makers need to express goals in terms of enabling for the long-term, rather than the checkbox delivery of headline figures. The latter inevitably leads to the rollout of the cheapest infrastructure that allows those boxes to be ticked and which will lock us into mediocrity for decades to come. They need to get over the ‘throw public money at BT’ mentality – it’s akin to the old industry aphorisms that ‘no-one ever got fired for buying IBM/Microsoft’, no matter how poor the product. They need to engage with communities, understand and support their diversity of need and capability in those communities and then be transparent in their approach and thinking, all of which appears to terrify them. This is vital – while it would be great to envisage a universal national FTTP infrastructure, I see no sign of the political will to fully fund it, even though it would be transformational to the entire country, at a cost probably 1/3 that of – for instance – HS2. But working with communities will enable the creation of cost-effective last-mile services at far lower cost to the exchequer than end-to-end commercial delivery. They need to define processes focussed on delivery before compliance with arbitrary and continually reinterpreted goalposts. We absolutely need to separate network provision from service delivery: Openreach MUST be split off from BT. Making OFCOM do its job robustly and without fear or favour is a prerequisite. A redundant and resilient fibre infrastructure to the network edge, the edge being defined by LOCAL breakouts accessible to both community and private operators. An infrastructure genuinely accessible to all players, public, private, local and national, without the artificial barriers put in place by the Openreach/BT monopoly. A strategy for creating coherence and resilience in that infrastructure at multiple levels, ranging from improving Internet Exchange and CDN diversity to working with UK NCSC to provide an umbrella for secure, resilient and trustworthy services. Peter, as many of you may know, was once the Chief Technology Officer of BT. Nothing has changed since he said that. We need to change this, for all our sakes. 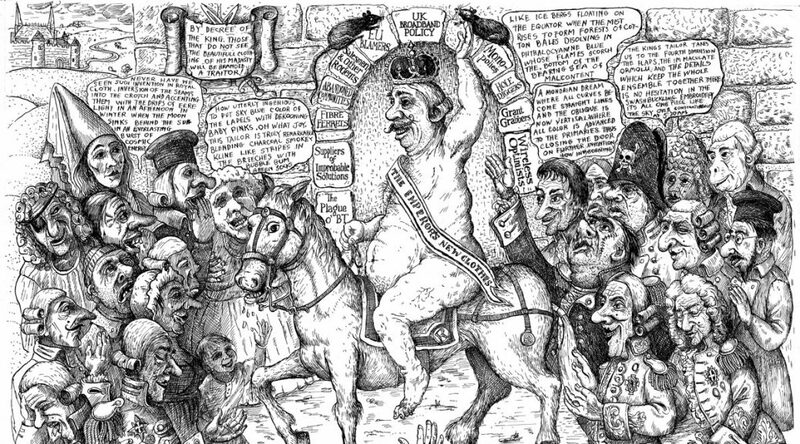 The Emperor’s New Clothes cartoon used here has been repurposed from the wonderful original (after Gillray) by New York illustrator Jonah Kinigstein. Richard Harris is a pioneer of the public internet. He has been an internet developer and researcher since 1984 and has been responsible for a wide range of innovations in online technologies and service models, across terrestrial, mobile, broadcast and satellite networks. He has provided technology, strategic and organisational consultancy to enterprises such as the BBC, Apple, Intel, AT&T Labs and SAS Institut. He is a co-founder and a director of Balquhidder Community Broadband. It’s interesting to note that B4RN now has partial coverage in about 26 BT exchange areas and every B4RN distribution node will have dual diverse feeds. Just to amplify your comments upon BT’s predatory behaviour they are only installing their existing exchange-based shared fibre solution which cannot be expanded as B4RN have done from their original 8 parishes now to around 50. This has been over a period starting in the Spring of 2012 and is still (thankfully) without a penny of taxpayers’ subsidy. Thanks Walter – I had to cut a lot from the talk to hit the time target so details of their shared fibre solution were removed – you’re of course quite right. We’re currently checking on CIC tax status in Scotland, as we’re so utterly disheartened with the utter failure of public bureaucracy to respond to community needs and opportunity that we’re looking at all options.